This paper addresses Acoustic Event Identification (AEI) of acoustic signals observed with a microphone array embedded in a quadrotor that is flying in a noisy outdoor environment. In such an environment, noise generated by rotors, wind, and other sound sources is a big problem. 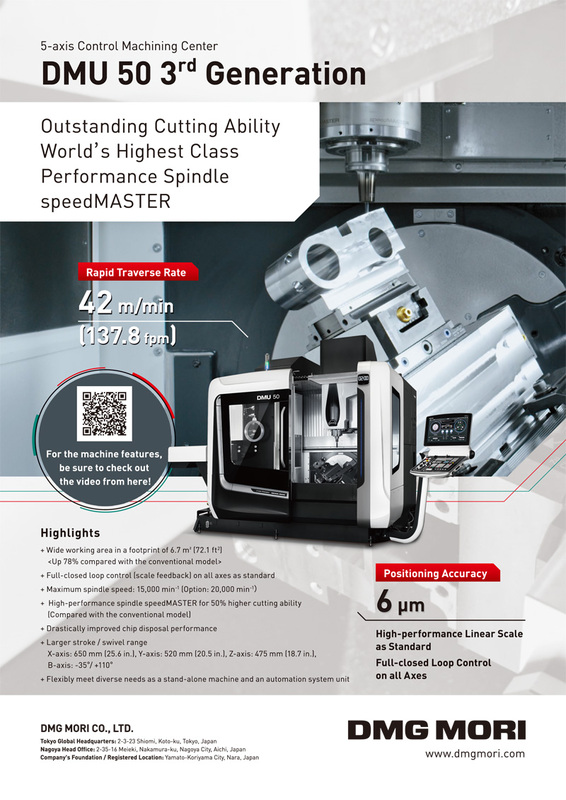 To solve this, we propose the use of a combination of two approaches that have recently been introduced: Sound Source Separation (SSS) and Sound Source Identification (SSI). SSS improves the Signal-to-Noise Ratio (SNR) of the input sound, and SSI is then performed on the SNR-improved sound. Two SSS methods are investigated. One is a single channel algorithm, Robust Principal Component Analysis (RPCA), and the other is Geometric High-order Decorrelation-based Source Separation (GHDSS-AS), known as a multichannel method. For SSI, we investigate two types of deep neural networks namely Stacked denoising Autoencoder (SdA) and Convolutional Neural Network (CNN), which have been extensively studied as highly-performant approaches in the fields of automatic speech recognition and visual object recognition. Preliminary experiments have showed the effectiveness of the proposed approaches, a combination of GHDSS-AS and CNN in particular. This combination correctly identified over 80% of sounds in an 8-class sound classification recorded by a hovering quadrotor. In addition, the CNN identifier that was implemented could be handled even with a low-end CPU by measuring the prediction time. 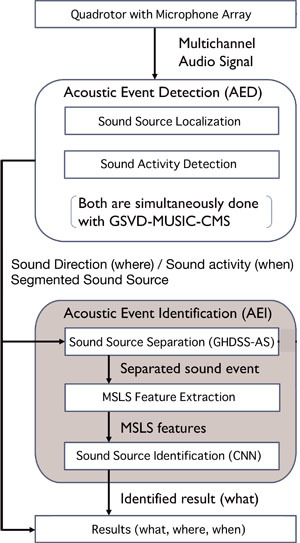 O. Sugiyama, S. Uemura, A. Nagamine, R. Kojima, K. Nakamura, and K. Nakadai, “Outdoor Acoustic Event Identification with DNN Using a Quadrotor-Embedded Microphone Array,” J. Robot. Mechatron., Vol.29, No.1, pp. 188-197, 2017. P. Ross, “Robot, you can drive my car,” IEEE Spectrum, Vol.51, No.6, pp. 60-90, 2014. K. Okutani, T. Yoshida, K. Nakamura, and K. Nakadai, “Outdoor auditory scene analysis using a moving microphone array embedded in a quadrocopter,” IEEE/RSJ IROS, pp. 3288-3293, 2012. K. Nakamura, K. Nakadai, F. Asano, Y. Hasegawa, and H. Tsujino, “Intelligent sound source localization for dynamic environments,” Proc. of IEEE/RSJ Int. Conf. on Intelligent Robots and Systems (IROS 2009), pp. 664-669, 2009. T. Ohata, K. Nakamura, T. Mizumoto, T. Tezuka, and K. Nakadai, “Improvement in outdoor sound source detection using a quadrotor-embedded microphone array,” 2014 IEEE/RSJ Int. Conf. on Intelligent Robots and Systems (IROS), pp. 1902-1907, 2014. J. Salamon and J. P. Bello, “Unsupervised feature learning for urban sound classification,” 2015 IEEE Int. Conf. on Acoustics, Speech and Signal Processing (ICASSP), pp. 171-175, 2015. A. Plinge, R. Grzeszick, and G. A. Fink, “A bag-of-features approach to acoustic event detection,” 2014 IEEE Int. Conf. on Acoustics, Speech and Signal Processing (ICASSP), pp. 3704-3708, 2014. H. Phan, M. Maas, R. Mazur, and A. Mertins, “Random regression forests for acoustic event detection and classification,” IEEE/ACM Trans. on Audio, Speech, and Language Processing, Vol.23, No.1, pp. 20-31, 2015. I. McLoughlin, H. Zhang, Z. Xie, Y. Song, and W. Xiao, “Robust sound event classification using deep neural networks,” IEEE/ACM Trans. on Audio, Speech, and Language Processing, Vol.23, No.3, pp. 540-552, 2015. Y. Bando, K. Itoyama, M. Konyo, S. Tadokoro, K. Nakadai, K. Yoshii, and H. G. Okuno, “Human-voice enhancement based on online rpca for a hose-shaped rescue robot with a microphone array,” 2015 IEEE Int. Symposium on Safety, Security, and Rescue Robotics (SSRR), pp. 1-6, 2015. K. Nakadai, T. Takahashi, H. G. Okuno, H. Nakajima, Y. Hasegawa, and H. Tsujino, “Design and implementation of robot audition system “HARK”,” Advanced Robotics, Vol.24, pp. 739-761, 2010. E. J. Candès, X. Li, Y. Ma, and J. Wright, “Robust principal component analysis?” J. of the ACM, Vol.58, No.3, Article No.11, 2011. C. Sun, Q. Zhang, J. Wang, and J. Xie, “Noise reduction based on robust principal component analysis,” J. of Computational Information Systems, Vol.10, No.10, pp. 4403-4410, 2014. P. Vincent, H. Larochelle, I. Lajoie, Y. Bengio, and P.-A. Manzagol, “Stacked denoising autoencoders: Learning useful representations in a deep network with a local denoising criterion,” L. Bottou (Ed. ), The J. of Machine Learning Research, Vol.11, pp. 3371-3408, 2010. Y. Lecun, L. Bottou, Y. Bengio, and P. Haffner, “Gradient-based learning applied to document recognition,” Procs. of the IEEE, Vol.86, No.11, pp. 2278-2324, 1998. G. E. Dahl, T. N. Sainath, and G. E. Hinton, “Improving deep neural networks for lvcsr using rectified linear units and dropout,” 2013 IEEE Int. Conf. on Acoustics, Speech and Signal Processing (ICASSP), pp. 8609-8613, 2013. Y. Nishimura, K. Nakadai, M. Nakano, H. Tsujino, and M. Ishizuka, “Speech recognition for a humanoid with motor noise utilizing missing feature theory,” Procs. of the 2006 IEEE-RAS Int. Conf. on Humanoid Robots (Humanoids 2006), pp. 26-33, 2006.